Obviously, he's just in the early stages of development, but I can't tell you how satisfying it is to see that actual attention to detail has been given to the basics. 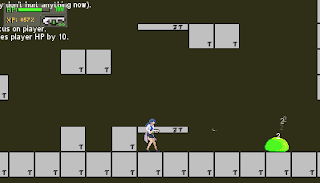 The physics feel solid, there are transition animations, and the H animation isn't just 2 frames that cycle. I've got high hopes for this one. My game on the other hand, well, it's getting there. I'm currently in the process of creating all the areas and finishing off whatever enemies I haven't done, in addition to optimizing some long standing problems. The game has a few parts that are playable, but I'm going to wait until the game is much more complete before releasing a demo. That would be funny though lol. P.S. : My Family will be pleased! Looks fun, thanks for sharing it. I shall check him out as soon as Thanksgiving festivities are over! hi Kyrieru, longtime lurker, just wanted to say your game is great and thanks for sending us the info on this new one. Looks like Datatony knows what he's doing. Cant' wait to see how both your and his games turn out! It sounds good with your progress on the H -game!! Is your next game the sequel of Kurovadis or quite another game that's similar to Kurovadis? The one I'm working on now is not a sequel. The next game I work on will either be a very small, quick game (2 months dev time) or a sequel to Kurovadis. It's nice to see people in NA working on erogae, I've started working towards gamedev myself. I'm still in the learning phase and nowhere near putting out a game though, and only have a couple of models made. I'm probably going to produce games with art similar to nano crisis, 3d models rendered to bitmaps, with fully animated cut scenes (that's the plan anyway ^_^;). When I'm fairly sure I'll have something more then just hot wind to show I'll probably start up a blog and such.